Precious gold, jet and amber objects from the Bronze Age are being permanently displayed at Wiltshire Heritage Museum to tell the story of the people who lived amidst the Stonehenge landscape. The remarkable collection of Bronze Age artifacts, many of them excavated from the landscape around Stonehenge 200 years ago by Georgian antiquarians Sir Richard Colt Hoare and William Cunnington, is going on permanent public display on Monday October 14 for the first time. Coming just two months ahead of the opening of the new visitor centre at Stonehenge, staff at the museum are hoping the new display will transform public understanding of the Stonehenge era and bring new visitors to a museum which lies equidistant between Stonehenge and the Avebury Stone Circle. The 500 Stonehenge-period objects include 30 pieces of gold treasure excavated from the famous Bush Barrow within the Normanton Down Barrows overlooking the Stonehenge monument. They have rarely been seen together by the public before. Among them is a beautifully decorated gold lozenge, a magnificent bronze dagger with a gold-covered haft, a golden sheath for a dagger and a ceremonial axe. Gold beads, necklaces, ear-rings, pendants and other items of gold jewelry dating between 2600 and 1600 BC complete the picture of the sophisticated Bronze Age and Neolithic culture that flourished around Stonehenge. The display also reveals a unique jet disc (used to fasten a luxury garment), rare traces of ancient textiles and two of the finest prehistoric flint arrow heads ever found. “These and other spectacular treasures from the Age of Stonehenge were unearthed by antiquarians and archaeologists in the late 18th and early 19th centuries, but until now it’s never been possible to give the public permanent access to them,” said David Dawson, Director of the Museum. 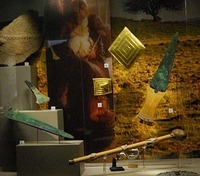 As well as the display of the treasures, four new galleries at the re-launched museum include recreations of some of the key places within the complex of burial sites where they were unearthed – including the Bush Barrow burial, where a Bronze Age chieftain was buried in regal splendour overlooking Stonehenge. “Stonehenge is an iconic monument – but this is the first time that such a wide range of high status objects from the spectacular burials of the people who used it, has ever been put on permanent display,” added Dawson. “Many of the items may well have been worn by Bronze Age priests and chieftains as they worshiped inside Stonehenge itself. “Axes and daggers on display in the new purpose-built galleries are identical to images of weapons carved into the giant stones of Stonehenge itself. The large specially-designed, high security and humidity-controlled exhibition facility, constructed inside the museum, cost £750,000 to build, with funding coming from the Heritage Lottery Fund, English Heritage, Wiltshire Council, the North Wessex Downs Area of Natural Beauty and other sources. Sources: Culture24, October 14, 2013, and Wiltshire Heritage Museum.